WHY CLEAR GENIUS? Clear Genius is a reusable water filtration system that fits Brita, Clear Genius and Pur water pitchers. Clear Genius reusable cartridges drastically reduce the waste created by discarding disposable plastic filters. Clear Genius provides those who currently use Brita, Clear Genius and Pur water pitchers a better way to filter water, allowing you to achieve a more environmentally conscious and cost effective result. HOW IT WORKS. Clear Genius water filtration system turns tap water into healthy, great tasting drinking water. Tap water is filtered through a blend of activated carbon and ion exchange resin, all contained within a non-woven, shell which also serves as a filtration element, to prevent black flecks. 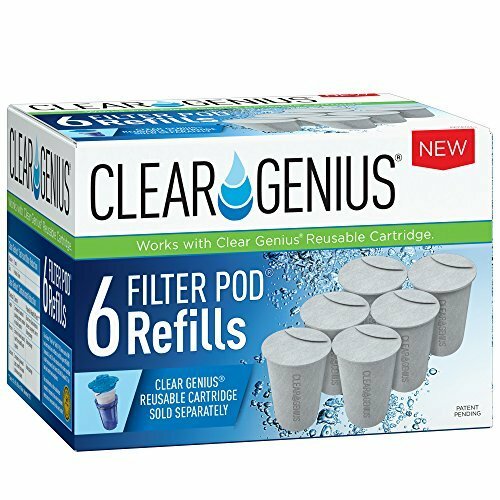 One Clear Genius Filter Pod Refill: Reduces harmful contaminants without removing minerals your body needs, filters 40 gallons of water - the equivalent of 300 (16.9 oz.) containers of bottled water, provides a more eco-friendly way to enjoy great tasting water, and reduces environmental waste by removing the need to discard approximately 6-12 plastic filter cartridges per year (based upon average household daily consumption of 0.5 gallons per person) as is typically the case with other leading brands. Works with Clear Genius Reusable Cartridge sold separately. CONTENTS: 6-Filter Pod Refills. Each Filter Pod filters 40 gallons of water - the equivalent of 300 (16.9 oz.) containers of bottled water. Certified by Water Quality Association. Each Filter Pod contains very high quality activated carbon derived from coconut shells blended with ion exchange resin. No pre-soaking is required for Filter Pod refills. CONTAMINANT REDUCTION: Chlorine (Taste and odor), Zinc (Metallic taste), Copper, Mercury, Cadmium. 6-Filter Pod Refills will filter 240-gallons of water. BPA-free. If you have any questions about this product by Clear Genius, contact us by completing and submitting the form below. If you are looking for a specif part number, please include it with your message.